Easy Install Air Conditioning Aircon247.com | discount portable air conditioning, fixed air conditioning, easy install air conditioning. ‘Through Wall’ or ‘Window Type’ air conditioning units are all in one systems. They are sealed units that do not need professional installation and can be mounted at low level or high level. They are extremely robust and ideal for cooling conservatories, houses, offices and machinery. Energy efficient and eco friendly, our easy install split air conditioning systems heat, cool and dehumidify. These systems consist of an indoor unit and an outdoor unit that is pre-charged with refrigerant; and are supplied with easy install pipe kits. Simple to follow instructions allow installation in well under two hours. A compact, cost effective and easy install solution for domestic and commercial applications where an outdoor unit is not possible. They do not require professional installation and can be mounted at low level or high level against an outside facing wall, allowing the two air vents to be positioned directly behind the unit. 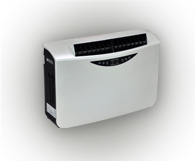 We have a fantastic range of Easy Install Air Conditioning Units here at Aircon 247. An easy install system is one that can be fitted with relative easy. 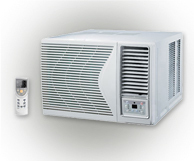 Our Window Type Air Conditioning units are in a nutshell, an all-in-one system. They come as sealed units and can be mounted at both low and high levels. 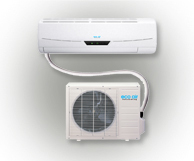 At aircon247.com, we have the largest and most diverse range of easy install air conditioning products for sale in the UK. This enables us to help you choose the right air conditioning solution for any domestic or commercial application with confidence. Select the sub categories above to see the most appropriate and best selling easy install air conditioning systems for any application or choose from our selected best selling products below. KFR26-YW/X1c Panasonic powered Black 'Iphone style' facia with Wifi.